Tesla has completed its quartet with the unveiling of the Model Y compact crossover this week. The new model is slated to make its retail debut in the fall of 2020 with three of four trim levels – that’s presuming Tesla hits its delivery goals for the first time ever . A base Standard Range Model Y, priced to start at $39,000, will be introduced in the spring of 2021, Tesla said. The other trim levels, which Tesla says should all be available in the fall of 2020, start with the $47,000 (and up) Long Range Model Y. There also will be a Dual Motor Model Y starting at $51,000, and finally the Performance trim, starting at $60,000. Both are all-wheel drive. The Standard Range will be good for up to $230 miles of range per charge, with a 0-60 mph acceleration time of 5.9 seconds. The Long Range will deliver up to 300 miles and 0-60 sprint time of 5.5 seconds. The Dual Motor drops to 280 miles but ups its sprint time to 4.8 seconds, while the Performance model stays at 280 miles but speeds things up even more with a 0-60 elapsed time of 3.5 seconds. Other competitors (yes, we know that Tesla fans will say there is absolutely no competition) in the $30,000-$60,000 price segment offer range varying from the new Nissan Leaf Plus, at 220 miles to the Hyundai Kona subcompact crossover, at 258 miles. There are a handful of new luxury electric crossovers in the 220- to 300 -mile arena hitting the market soon as well. They typically start in the $70,000 area (which is where we think a Model Y Performance that’s decked out with popular Tesla options will be). The list includes the Audi e-tron, the Mercedes-Benz EQC and the Jaguar I Pace. Ford, Volkswagen and BMW are among the other automakers promising new electric crossovers within the next two years. The Model Y will share a platform and most of its looks with with the Model 3. Although labeled a crossover – which has SUV connotations – the Model Y is more of a tall-roof hatchback. It uses conventional rear doors, not the fancy and overhead “falcon wing” doors that gave Tesla production and quality control headaches with the Model X crossover. All Model Y trims will come with a 15-inch touchscreen control and information centers, panoramic glass roofs, seating for five (there will be a 7-seat option for an extra $3,000), 66 cubic feet of cargo space with the rear seats folded flat, and the ability to use the Tesla Supercharger network, including the new V3 chargers. 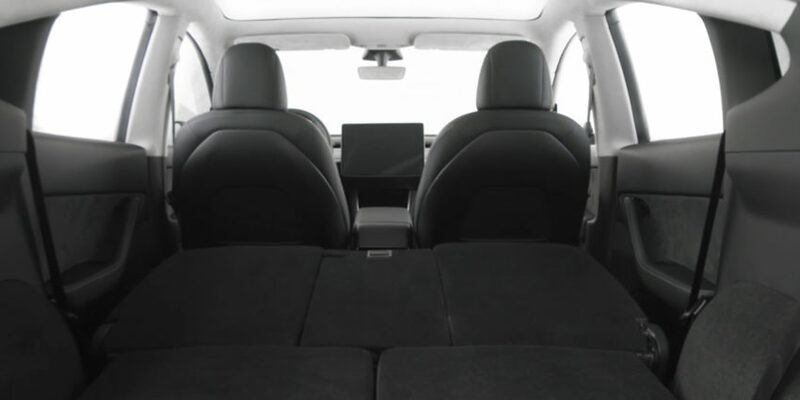 Model Y will offer a spacious cargo area with rear seats folded down. As with other Teslas, the Model Y will have all the hardware necessary to go fully autonomous when that becomes legal. But actuating the stuff will be a $3,000 to $5,000 upcharge – depending on what levels of self-driving capability are desired. Tesla said it will build the Model Y at its gigafactory outside of Reno, Nevada – a site that is producing batteries for the company but isn’t yet outfitted for vehicle production. And with the Model Y, if your garage is large enough, you soon will be able to park all for mainstream Teslas (we’re not counting the promised Roadster, Tesla pickup or Tesla Semi), side-by-side so the nameplates spell out S3XY. Tesla CEO Elon Musk had to settle for Model 3 to complete what Models S, X and Y started, and hope people still get his joke.